If your dog has ever been sprayed full-on by a skunk, you'll have some idea of how intense the odor is... and how difficult skunk odor removal really is! The reason it's so difficult is partly because skunk spray is an oil. And partly because that oil is packed full of thiols - organic compounds which contain nasty smelling sulphur (among other things). All of this means that removing skunk odor from your dog is a tricky business.... tricky, but not impossible. This page has all the tips and advice you need to make sure you de-skunk your dog in the quickest, most effective, and least messy way possible. 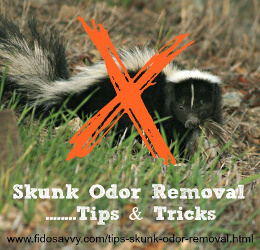 There are several excellent products that have been formulated to eliminate the awful smell of skunk oil. There's also a simple home-made skunk odor remover which works really well, and whose ingredients are cheap, readily available... and may even be in your home right now. It's the baking soda/hydrogen peroxide formula and I know it works because I had to use it myself very recently! You can learn more about this (and other remedies) right here... Help for a Dog Sprayed by a Skunk! These products and potions are vital, and without them your dog is going to be stinky for quite some time. But unless you follow a few simple rules when using them, you won't be nearly as successful as you could be. SO... check out these tips and tricks before you start work on that stinky Fido. I'm sure you're going to be much happier with the end result! Speed is of the essence here, because the longer that skunk oil is on your dog, the more difficult it is to get off. Buy some proprietary skunk odor remover, or make sure you have the ingredients on hand to make up your own home remedy. Also be sure to have rubber gloves, an old pair of jogging pants and a shirt, a couple of old towels and a bucket stored somewhere memorable. Keeping these supplies somewhere close at hand will mean you're ready to go in the blink of an eye if/when disaster strikes. Make sure your hands and clothing are protected before you start cleaning Fido up. Skunk spray is OIL, and it will cling (tenaciously) to everything it touches. Your dog's first instinct will be to rub it off... and he won't care whether he rubs it off on the grass, a tree, his paws - or your jeans, furniture or Persian rug! Take a minute to pull on an old pair of jogging pants, an old shirt, don rubber gloves and grab hold of an old towel to wrap Fido in. Hopefully you've got these things ready for just this scenario. Trust me, you'll be really glad you did. Most skunk odor remedies work best on dry fur. When your dog smells so bad that your eyes are watering and your nose hurts, and he's rubbing at his face and altogether acting pitiful, your first instinct may be to grab the hose or a bucket of water. You should use paper towels, or an old towel or rag (it will need to go straight into the trash afterwards) to wipe off as much of the oil as you can, but don't use water. Water causes the cuticle of the hair shaft to open up, and allows the skunk oil to penetrate deeper, that makes it more difficult to remove. If you've bought an odor-remover product, follow the instructions on the container. If you're using a home remedy follow the instructions that go along with it. BUT there is somewhere that you should use lots of plain, clean lukewarm (barely warm) water... that's to rinse your dog's eyes! Often it's Fido's face which gets the mother-lode of skunk oil and this is highly irritating to his eyes. Rinsing them well with lots of clean water can help reduce the irritation and inflammation and relieve some of the discomfort. Because Fido's face may be 'ground zero' for skunk-oil damage, you're going to be working on that area pretty closely. Skunk oil can cause stinging and burning of the eyes and nose, so your dog is already likely to be uncomfortable. Don't make the situation worse by getting odor-remover or shampoo in his eyes or up his nose. You can use a contact lens rinse or saline eye solution to rinse the worst of the oil out of Fido's eyes if you have one handy. Use a cloth or sponge to clean his face and stay away from these delicate areas as much as possible. You can put a couple of drops of mineral oil, or olive oil, into his eyes to protect them. A smear of vaseline around their rims helps too. Protect his nose with a little vaseline around the edges, and put cotton balls in his ears (gently, and just in the outer area, don't force them down there!). One application of product will not be enough! Count on having to apply product, rinse, shampoo and repeat... at least twice, more likely three to five times. Of course, a lot depends on how comprehensively Fido has been 'skunked'. Most dogs get sprayed in the face from fairly close range, but it's not always the case. You should be able to see (and will definitely be able to smell) where on your dog's body most of the oil is. Concentrate your efforts on that area, and be careful not to spread the oil to other, unaffected, areas. The oils in skunk spray cling very effectively to your dog's coat, and it's difficult to remove all of these oils from long, curly or thick coated dogs. Having Fido's hair trimmed or cut (after bathing) may really help to reduce the odor. Getting sprayed by a skunk isn't just nasty, it can be dangerous too. Skunks can carry Rabies, and if Fido is bitten he could be at risk (and so could you and your family). Even without Rabies in the equation, a bite/scratch could become infected and cause problems. Once your dog is clean and as odor free as possible, it's a good idea to check him thoroughly for bites/scratches or wounds. Because most dogs are trying to sniff/catch/nip the skunk when they get sprayed, their faces take the worst of the blast... and are most at risk of being attacked. So, take extra care to look closely at his face, muzzle and ears. Also his front legs, shoulders and paws. If you notice ANY signs of injury, have Fido examined by your veterinarian and fill him/her in on what's happened. There are also rare, but possible, serious side effects of your dog having been 'skunked'. Compounds in the skunk's spray (if it's concentrated enough) can occasionally cause damage to your dogs red blood cells, leading to a form of anemia which is serious and requires veterinary treatment. There are home-made potions that can help (check out this one here), but there are lots of others that are dubious at best. Of course I can't tell you what to do, and obviously I haven't tried all the variations out there, but common sense deems a few of them unlikely to be helpful! Coca-cola - if you've ever tried to clean up spilled coke you know how incredibly sticky it is. If I've already got a stinky dog, I don't want a sticky, stinky dog right? Toothpaste - I understand that the minty scent might help mask the eau-de-skunk (a little), but rubbing toothpaste into Fido doesn't sound easy.. and how many tubes would I need for a Rottweiler?? Beer - no way, for similar reasons as coca-cola given above. Plus alcohol and dogs is a bad combination. Vanilla extract - um, again no. Sticky, would need bottles of the stuff, and it will only mask the smell, no cleaning properties or chemical reactions there. Ketchup - tomato juice has been shown to be somewhat effective (but not great) but ketchup? Sugary, sticky, no real acid to attack the oil... how is it going to help? White Vinegar - okay, this one MIGHT have some merit. Vinegar is good at breaking down some odors (urine for example). It may be worth a try. Although once your dog has been treated and thoroughly dried you may think that you've eliminated all traces of skunky-stink.... the next time he gets wet you're more than likely to find out that you were wrong! Water seems to trigger any residual skunk odor, this is normal and will pass eventually, given time. A bath every couple of weeks with a gentle shampoo won't hurt, but don't continue to use harsh chemical products (or home remedies) over and over again because they can damage Fido's coat and skin. It's very unlikely that you'll get past your dog's skunk encounter without the smell invading your house, at least to some extent. The amazingly stubborn qualities of skunk oil means that it's difficult to remove from most surfaces, and just a tiny drop or smear can create a lot of odor... and linger for a l-o-n-g time. There are a couple of products on the market which are very effective at getting rid of that awful skunk-y smell. They work equally well on your dog, your home and your clothes. My favorites are Nature's Miracle Skunk Odor Remover and Skunk-Off Liquid Soaker . The same home-made skunk odor remover that is a popular and effective way to de-skunk your dog can also be used to clean hard surfaces such as floors and walls and soft furnishings such as carpets, upholstery and curtains. Be warned that it may have a slight 'bleaching' effect (due to the hydrogen peroxide) so it won't hurt to do a test-run on an inconspicuous area first if you're worried about damaging your stuff. You can also put small bowls of baking soda around the house to absorb the odors in the air. If you've ever used Simple Green when cleaning your home, you'll know that it's great at cutting through grease/oil. This means it's also a good choice for cleaning up floors and walls after a skunk attack. Just dilute the product with warm water (follow directions on the bottle) and clean all surfaces thoroughly. Mix household bleach with cold water, following the 1 part bleach:10 parts water ratio. This is good for hard surfaces including concrete, but you don't want to use it on carpets, curtains or clothes. White vinegar can be used to clean/deodorize hard surfaces. Small dishes of vinegar set out around the house is another way to absorb odors. Small bowls of fresh coffee grounds set around the house. Coffee grounds both absorb and mask odors. Charcoal is often used to absorb odors. Try putting grill charcoal briquets in a dish/bowl and set one in each room of your home.